This is really off-topic, except that I took the photos. But it's from a recent experience that needs to be talked about. 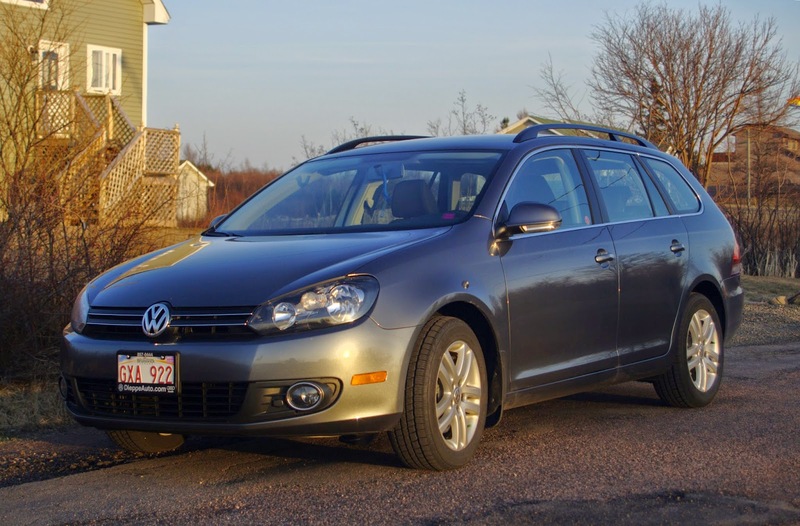 Back in March 2010, I bought a great car - the VW Golf Wagon TDI (Turbo-Diesel Direct Injection) pictured above. My goodness, this car had a lot going for it, and in the end, it was a good purchase that panned out - but not without a major problem, which literally FORCED me to trade it for the 2014 Trendline 2.5 gas model. I had bought the TDI while I was still working, which caused me a long commute of 100 Kms. every day - the Diesel engine really made sense then, with it's near 50 MPG warm weather fuel economy. But two years into ownership, I retired, and ended up driving a lot less, not to mention the peculiar phenomena of living in a Canadian Province, which I'm sure must be the only jurisdiction in the world where Diesel fuel came to cost significantly more than gasoline - in winter especially, sometimes 12 cents per litre (50 Cents per US Gallon) more. Although this frustrated me, I still thought I must be saving a bit of money by driving Diesel. At least, for the first four years of ownership, I could also boast of trouble free driving. But in March of this year (2014), my warranty ran out, and that seems to be exactly when trouble started running in. At first, it was nothing serious - just a couple of side mirror signal lights, for which the entire lower mirror housings had to be replaced. Also, the Diesel engine braking system worked so well, the rear brakes were rarely used, and they corroded so bad, I had to get a brake job on the rears only. After 131,000, the front brakes were still good - which is phenomenal on any car. As a rule, the front brakes are the first to go. Also, I had no problems with steering, suspension or exhaust in those first four years,, which I regard as excellent. But then came the big story. I won't go into detail about how it happened, but basically, the Dealer Service Dept. misled me concerning a Check Engine Light indication that began a few months ago. As it turned out, my continued driving, because they said "don't worry about it until maybe winter" led to a $4000 system breakdown, associated with the car being a Diesel. It was an honest mis-communication on both my part, and their part - I could have done more research into the problem, which I finally did when it was too late, but they acknowledged their error, and allowed me full wholesale on a trade-in. As much as I loved that new TDI with it's amazing 236 ft-lbs of Torque at only 1700 RPM (you simply have to experience driving this if you haven't already), I determined that the TDI, in the interest of clean air, was way too complicated, so on the trade, I opted for the 2.5 Liter 5 Cylinder gasoline engine instead. This engine too has plenty of Torque and Horsepower, but it comes on at a much higher RPM, so the car doesn't feel as peppy. But already I'm seeing 36 MPG, compared with the TDI's 48-50, for which, with the cheaper fuel and less driving, I should not see much of a rise in my motor fuel expense. This engine is not near a as complex, and was only created for the North American market, and is regarded as VW's most reliable new engine. The unfortunate part is, like all good things, it's being phased out in favour of a turbocharged 4 cylinder gasoline engine which is almost as complex as the TDI. So I may seek to ride the wave of endurance with the "low-tech" but still economical 5 cylinder. So the big question is - what's changed in 4 years? True to form, VW has changed nothing in the successful production run of the Golf Wagon. This body type, along with the 5 cylinder 2.5, is also being phased out this year - the 2015 Golf is already in Showrooms, with no Wagon option, and no five cylinder. The Marketing Wizards seem to think nobody wants an "Estate Wagon" any more, when they can have an SUV or Mini-Van Cross-over instead. If that's true, I wonder why I'm seeing so many of these Golf Wagons, not to mention the Jetta Sport-Wagon (which is almost identical, but ended in Canada in 2009) on the roads? I suspect that, in spite of being a car that people really want, the people in Marketing which love to tell people what they really want, don't want the little super-extended hatchback wagon, to cut into their more profitable sales of bigger SUV's and X-Over cars. Both the 2010 and 2014 are by far the most comfortable cars I've ever owned, period. Even with my often painful muscular condition, I could drive this car all day without aggravating my pain - it's a true therapeutic chair on wheels if there ever was one. Thankfully, this has not changed a bit, and just as thankfully, there is no difference in seating, or interior dimensions between the Highline, and more costly Comfortline models. Every creature comfort, and interior feature for driver and passengers is identical, right down to the leather wrapped steering wheel and shift knob. Actually, the shift knob for the Automatic Transmission is the only thing that has changed - the older model had a T-Handle, while the new model has more of a round knob, with the inter-lock release on the front. I prefer the older one, but quickly got used to the newer. I say a big "who cares" to all of these. Even without the spiffy looking Alloy Wheels (the Highline has conventional steel wheels and silver plastic hub-caps instead), the tire size is identical at 205-55-R16 so there is no difference in handling. Think too about the difference in cost if an Alloy wheel gets damaged as opposed to a plastic wheel cover. Besides, I recall the Alloys as being quite heavy, so I suspect very little difference in unsprung weight, which normally tends to make a car equipped with Alloys pitch around a bit less. But I do not see any difference in the ride and handling between these two cars, except the older TDI had a slightly more on-centre feel to the steering, which could be attributed to tires alone. At 80,000 Kms, I had replaced the TDI's original Hancooks with Michelins. And guess what? The new 2.5 has me back to Hancooks! I have inflated these to 42 PSI, which in itself seems to have made a huge difference. I had kept the Michelins up to 44. Mud-Guards on all 4 corners. The big difference between the two cars is the engine and transmission related driving experience. I've already mentioned the TDI's amazing low RPM Torque, and engine braking. It was equipped with an "automatic" 6-Speed Direct Sequential Gearbox (DSG) with dual computer controlled clutches, whereas the 2.5 has a 6-speed conventional automatic with a lock-up torque converter, commonly known as a "slushbox" due to it's less direct application of the engines power to the road, and reduced fuel economy. This gives the TDI a much more "seat of the pants" feeling which I immediately fell in love with. The 2.5 feels more like a Mom-Mobile minivan in comparison. The engine sounds are different too, from the inside, but neither one ever sounds too busy. The TDI has a wonderful low V8-like rumble, while the 2.5 is very quiet, so that the whine of the transmission is more of what you hear than the engine, unless you really step on it, in which case the 2.5 has a distinct raspiness, that's not like the drone of a 4 cylinder, nor is it like the downright stupid rough sound of a V6. It's a lot more like a BMW Inline-6, old Audi 5 Cylinder or the old discontinued VW VR-6 I think. Stepping on the gas pedal, the 2.5 is understandably less responsive from a direct stop, having less torque available, but as the RPMs build, so does plenty of power, in typical gas-engine fashion. With the TDI, the power is already all there, just waiting to be used. Still, the 2.5 is a lot more like North American drivers are used to, and so, if one has never experienced a TDI, they would find the 2.5 more than adequate. For me, it just took a bit of getting used to. My wife probably didn't notice the difference,as she just mashes the gas on take-off anyway. She's far more aggressive behind the wheel than I am. Gas mileage for the 2.5, although less than that of the TDI, really surprised me (good surprise), because many reviewers were quite critical of it. With my first tankful, I got 32, with the second I got 35 and with the third, got 36 MPG - not bad in comparison of the TDI's year round average of 44 MPG (Diesels get worse mileage during the winter, because winter Diesel fuel is designed to keep flowing at -40 degrees, and has less energy content). Contaminated Diesel Fuel will result in the need to replace entire fuel system - cost is over $10,000! An Exhaust Brake flap, with enough reported failures that VW extended the warranty for it. Piezo Glow Plugs which cost over $200 each! The DSG Transmission, which is only available with the TDI, needs a $300 fluid change every 60,000 Kms. The conventional automatic in the 2.5 never needs a fluid change, although it is optional, and probably wise to do at 120,000 or so. The TDI requires expensive and hard to get engine oil, to maintain the health of the DPF. 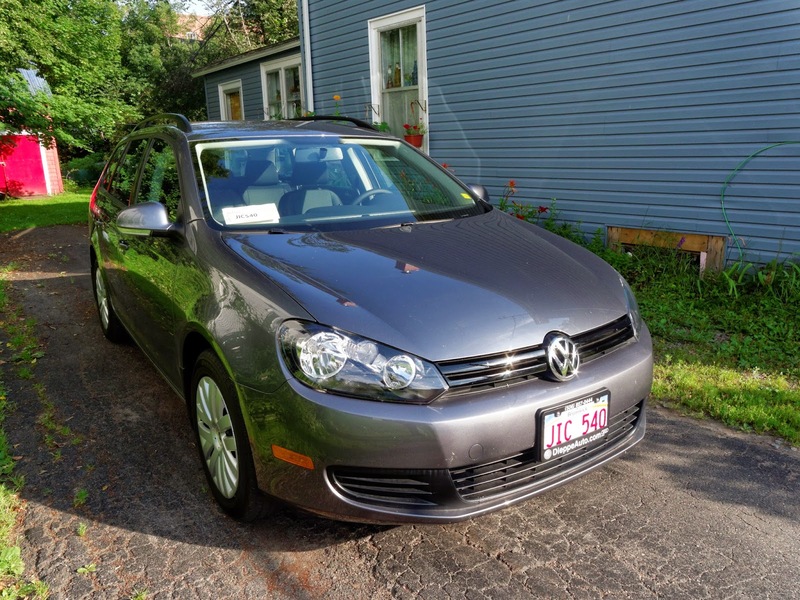 In addition to all of this, the TDI can only be had with the Comfortline model, and if equipped with the DSG Transmission, adds $5000 to the price of the car. You have to do a lot of driving to make the extra gas mileage worth it, and a lot of driving carries a lot of added maintenance cost and almost guaranteed very expensive failures. Take my advice - this is one of the finest cars on the road today, with a modest price compared to it's Estate Wagon competitors, like the Audi A3, BMW 3 and 5-Series, or I suppose the big 4-Door Mini. One can be had at around $24,000 plus all the usual stuff. My advice is do not even take the TDI for a test drive, because I guarantee you'll fall in love with it. Make sure if you do go for the TDI, you can afford to trade it before the Warranty runs out.